Android Market is the one-stop store where most of the apps for Android-based smartphone mobile device can be searched, downloaded for free, or purchased to install. Android Market has all the while been only accessible through the Market app built-in by default on all Android OS, until now. 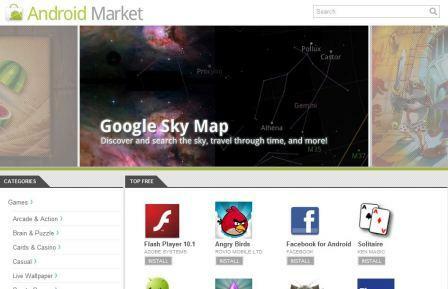 Google has officially launched the web-based Android Market at the Android Honeycomb event at the Google HQ, which has been introduced on Google I/O 2010 event. With the launch of web-based Android Market webstore, Android device users can also any web browser on computer or mobile devices to browser for apps to download and install on Android. The Android Market webstore features featured apps and games in the slideshow, and the usual top free and top paid apps and games, on the whole for all apps and games or by category. User can search and view the full details the apps or games, including user reviews, changelogs and permissions required. The Android web app store even allows user to send install Android apps on the mobile device directly from the web, by signing in to Android Market with the same account user uses on the phone. Visit Android Market on the web via https://market.android.com/.